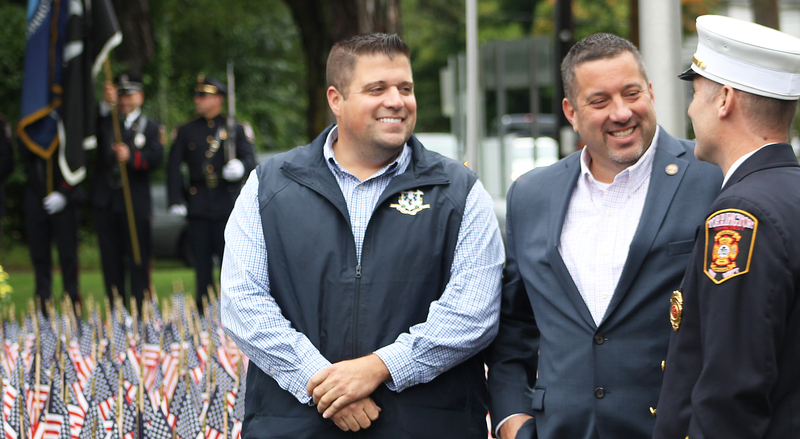 TORRINGTON – State Representatives Jay Case (R-Winsted) and Brian Ohler (R-North Canaan) participated in a September 11th Memorial Ceremony at Torrington’s North End Fire Station. The representatives each expressed gratitude for the service of the community’s first responders and delivered remarks to the crowd of police, EMT, firefighters, and members of the public. Following their remarks, three candles were lit as a memorial to all first responders who lost their lives on September 11, 2001. A red candle was lit representing fire personnel, a blue one representing police, and a white one representing EMTs. The public is encouraged to visit the September 11th Memorial, located in the front of the North End Fire Station, to remember and reflect.